Quinoa. [keen-waa]. n. a grain crop grown for it's edible seeds. or, better known as that stuff that sort of tastes like rice but looks like tiny pasta. it's high in protein and fiber, gluten-free, vegetarian-friendly and contains all 9 essential amino acids. 1 cup of cooked quinoa (1/2 cup uncooked) contains 222 calories. 4g of fat. 39g of carbohydrates. 5g of fiber, and 8g of protein. Coined as a 'superfood', quinoa dates back three to four thousand years ago when it was known as, "the gold of the Incas" as it was believed to increase the stamina of their warriors. I don't know about you, but being unmatched in physical strength and mental endurance sounds pretttty darn appealing. am I right!? but really…why eat quinoa? - Quinoa is one of the most protein rich grains, containing all 9 essential amino acids and 8 grams of belly-filling protein per cup. - Quinoa contains almost 2x as much fiber as any other grain (e.g. rice, corn, wheat), helping to prevent heart disease, reduce high blood pressure and diabetes and aiding in weight loss. - Quinoa contains both iron and magnesium, helping keep your red blood cells healthy and aiding in blood sugar regulation. - Quinoa contains lysine which helps with tissue growth and repair. - Quinoa is high in Riboflavin (B2) which helps to improve energy metabolism within the brain and muscle cells. But how do I make it!? 1. In a large saucepan on high heat, bring 4 cups of water and 1-2 tsp of bullion to a boil. 2. Once boiling, add 2 cups of uncooked quinoa. Stir. 3. Reduce to medium heat, cover, and let cook for approximately 12 minutes, or until liquid is absorbed. 4. Once absorbed and the quinoa has begun to spiralize (little strings will appear), reduce to low heat and continue stirring for an additional minute or two. 5. 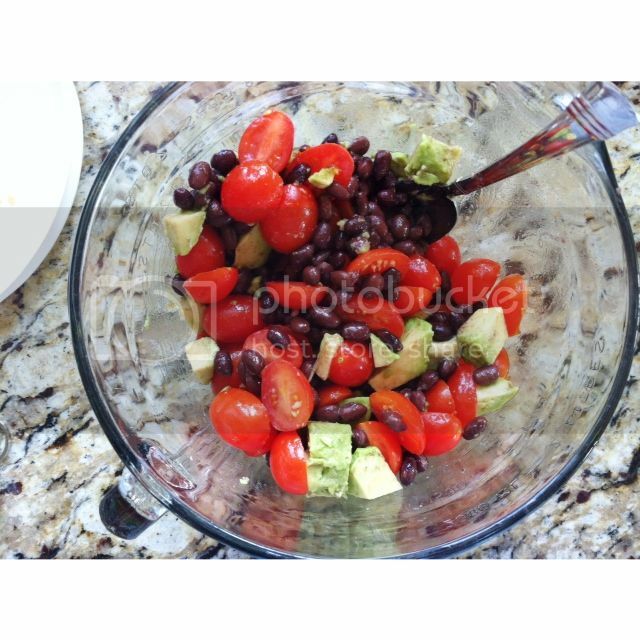 While quinoa is cooking, in a large bowl, combine beans, tomatoes, avocado and any desired add ins. 6. Once quinoa has cooked to a fluffy texture, remove from heat and add to other ingredients. Mix to combine. 7. Squeeze lime juice on top and mix thoroughly to incorporate. Add basil, sea salt and pepper, if desired. 8. Enjoy hot or cold! 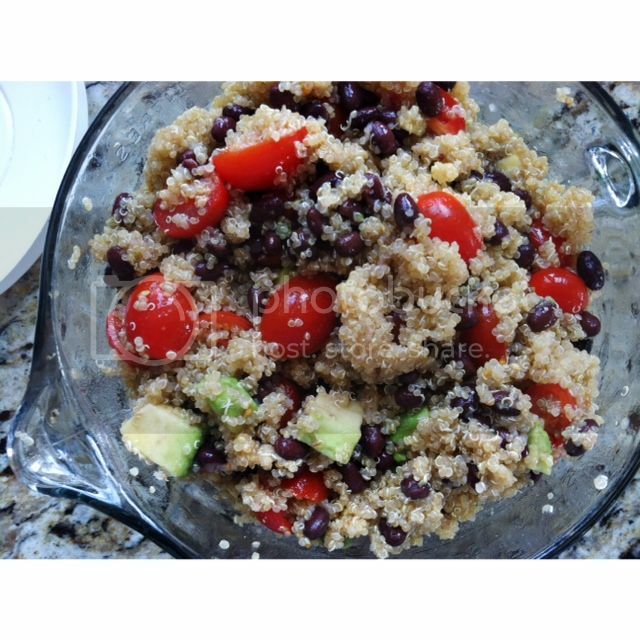 I love making a big batch of this quinoa salad to keep in the fridge for quick meals throughout the week. I'll often add it to a bed of spinach with some grilled chicken and a drizzle of balsamic vinegar. The best part about it is it's versatility! You can keep it vegetarian, you can add feta for a bigger kick, you can mix in a protein of your choosing (chicken, shrimp, etc.) for a bigger, more nutrient-dense meal, you can stuff it in a cooked sweet potato…the options are endless! I also really enjoy this sweet quinoa salad with dried cranberries and pistachios by my dear friend Anne over at The Fountain Avenue Kitchen. yum. it's the perfect side dish to complement a savory meal. So even if you don't know how to pronounce it, you should give it a try. It can be made 100 different ways and it will put hair on your chest (so to speak). How can you go wrong!? What's your favorite quinoa recipe? Newer PostTime: the [not so] secret to healthy eating.